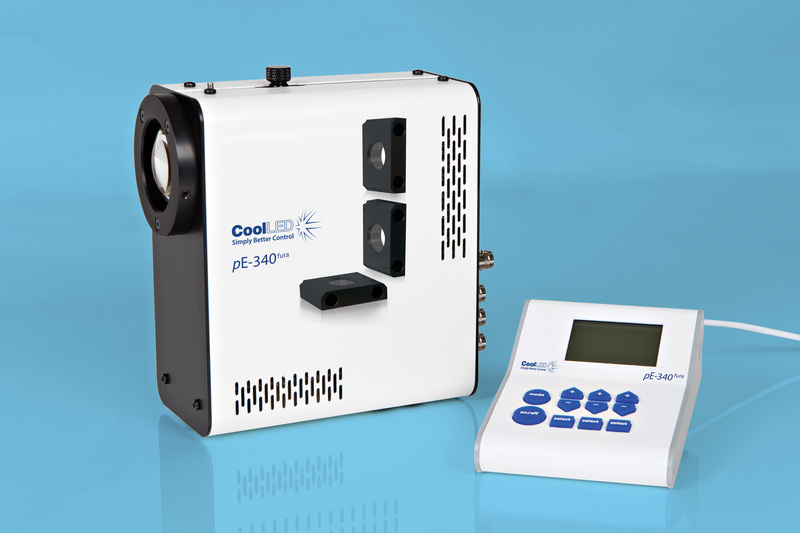 Through partnership with The University of Strathclyde, CoolLED are excited to announce the latest leap forward in LED illumination for microscopy – the pE-340 fura. The pE-340 fura is a bespoke LED illuminator for Fura-2 imaging which also supports everyday fluorescence microscopy in a compact and affordable package. - A genuine 340nm LED with more than enough intensity at the sample plane to out-perform traditional approaches. - A very powerful LED at 380nm which is suitable for both Fura-2 and everyday dyes such as DAPI and Hoechst. - Can be mounted directly on a vast range of microscopes, old and new. - Can be coupled to the microscope via a UV optimised liquid light guide and optional collimator for applications which are particularly sensitive to noise of any type. - Can also be controlled via convenient BNC TTL connections for precise illumination control in as little as 20 microseconds. Connectivity includes “per channel”, global and a sequence runner. - Higher signal to noise gives cleaner images and data whilst requiring less Fura-2 dye, reducing toxicity and costs.